Right off the bat, I need to say that I received this e-book free of charge through NetGalley. It is part of a series of short books printed for the express purpose of making readers aware of threats to the environment. Chapter 1, Tigerland: The author relates his experiences as a Peace Corps volunteer tracking tigers for the purpose of recording a population count in that mountainous area of Nepal. The reader learns how tigers are tracked, about the Nepalese culture, environment, landscape amid dangerous and sometimes humorous anecdote. In fact, I really liked the author's sense of humor and felt it made the book. Chapter 2, Kingdom of the Snow Leopard: Dinerstein returns to Nepal for the purpose of seeking snow leopards with Helen Freeman, director of education at the Seattle Woodland Park Zoo. They search for the snow leopards at a higher elevation than previously attained. Although there is much for the reader to take away from this section, I didn't find it as entertaining as the first section; however, there was plenty to take away from an educational standpoint. Discovering Big Cat Country is a mere 52-pages long, entertaining, but not like a normal adventure book in the sense that there is not some big feat that Dinerstein is seeking to achieve. As stated in the first paragraph, the goal of the publisher is to inform the public of environmental concerns in regards to big cats and their habitat. The book accomplishes this in an entertaining way. This book provided an interesting trek through the process of discovering one's ancestors. Granted, at times the minute detail of transcribing documents at e-mails between Mr. Bremner and his contacts seemed overdone, but the end result was a good education in the entire process of genealogical tracking. Doug Bremner takes the reader through the system of finding out who his real grandmother and hence mother (an adoptee) really were. Bremner admits he is addicted to genealogy and recognizes that he isn't alone in his obsession citing several cases. His obsession drove him to obtain a blood test which claimed he is 44% Northern European, 34% Middle Eastern, 22% Southeastern European and 4% Sub-Saharan African. OMG! Incredible to be able to obtain that detailed of information through a DNA test. How does a DNA test isolate descent anyhow? book although not one that would appeal to a large number of readers due to the limitation of its subject matter. However, if you are curious about genealogy or how one person solved his own hereditary mystery , it would be a worthwhile read. I received a free copy of this book from the publisher, Premier Digital Publishing, through NetGalley. I really liked the subject matter of this book, Civil War photography, with black and white photos sprinkled throughout the book. It gave the book the same feel of pretended authenticity that Miss Peregrine's Home for Peculiar Children offered with its black and white photos of children doing odd things. Obviously, both stories are very much fiction, but my intention is to note what a great tool the black and white photography is for books of this ilk. In both cases, I found the quality of writing lacking, but the pictures were useful in drawing the reader back into the story through showing what the narrators saw. 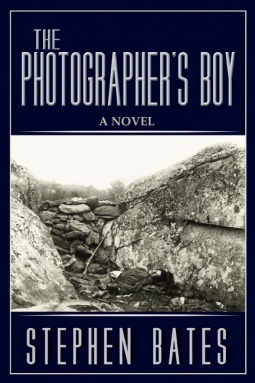 By comparing The Photographer's Boy to Miss Peregrine's Home for Peculiar Children, I do not intend to infer they are equals, in my mind Miss Peregrine's is superior, but The Photographer's Boy has its charm. There are two story line's advancing throughout this book: one of young Alfred Barker, photographer's boy to Matthew Brady, a famous Civil War photographer, and a second of Gene and Izzie Hoffsettler, the new owner's of Alfred Barker's house. Gene and Izzie find some glass plates etched with Civil War photos in an outbuilding while cleaning up the place in their attempt to turn it into a bed and breakfast. Of course, the plates put them on the trail to find the history behind them. This leads them to a friendship with Miss Annabelle who knew the Barker family. I like the look at Civil War history through photography. I like the photography. The quality of writing brings this book down. As much as I'd like to rate it higher, I can only dole out 2 stars. Lots of love for audiobooks!